Before America could develop a two-party system and hold contested Presidential elections, the nation had to endure an often bizarre, nearly completely opaque, and incredibly nasty election in 1796 when John Adams bested Thomas Jefferson by just three electoral votes. From the intellectual pinnacles of the Declaration of Independence and the framing of the Constitution, the United States decided the best way to pick a new president was for two men to have their operatives throughout the country sling mud at each other. In other words, it wasn’t too much different from today. 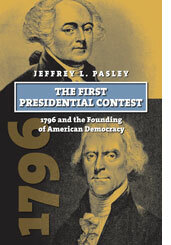 Jeffrey Pasley recounts in interesting detail all the machinations that went on to creating a political culture in the United States where people could take sides and pick a candidate they wanted. (It helped a lot to be a property-owning white male to do this.) George Washington was chosen as the nation’s first president because it was just assumed that he was the only man with the stature to hold the job. But, it didn’t take many years for a good chunk of the country to realize that perhaps George Washington wasn’t as God-like as his supporters made him out to be. (This is not an exaggeration, there was a famous painting of Washington rising to heaven as an otherworldly figure.) The young United States soon split into two camps over items such as national finance, relations with France after its revolution, and, most notoriously, the terms of a treaty between the U.S. and Britain negotiated by Chief Justice John Jay. Washington decided not to run for a third term in 1796. His vice president, John Adams, was the heir apparent. Or was he? Adams could not say that he actually wanted to be president because that was considered ill-mannered at the time. Thomas Jefferson wanted to be president, but he was in the same bind. In fact, Alexander Hamilton tried to campaign for Adams, by spreading the word that Jefferson wanted to be president, making Adams look more virtuous and Jefferson like an overly ambitious man. Since the process of choosing electors was different in every state (they pretty much just made up the laws as they went along back then), it was hard to figure out just how to become president. To complicate matters, at the time, there was no separate balloting for president and vice president. Electors just wrote down two names. The person with the majority of the votes was president and the runner-up was vice president. The Nate Silver of 1796 would have called his site 276, although the winner needed just 70 votes, since there were just 138 ballots. Each side in the election, which didn’t have formal names but are generally referred to as Federalist (Adams) and Republican (Jefferson) didn’t wish to campaign on the issues. Overt campaigning in public by a presidential candidate would not become acceptable behavior until 1840, and did not become expected behavior until the 20th Century. Federalists accused Jefferson of being an effete snob, who spent too much time engaged in scientific debates. And Jefferson was accused of cowardice because he had to flee the Virginia state capital to avoid capture by British troops during the Revolution. Jefferson was branded as someone who would destroy Christianity in the country and turn the country into a version of the now extremely violent France. Most of the accusations were written by a somewhat obnoxious South Carolina Representative named William Houghton Smith. Adams, who helped Jefferson write the Declaration of Independence, was accused by Republicans of being a royalist, who wanted to start a hereditary monarchy in the United States. And since Adams had a son, he could start a dynasty! (Jefferson could not because he only had daughters.) Some higher-minded Republicans just thought Adams should not be president because he was a little bit fat. States chose electors on different dates in different methods. Some states had direct election statewide. Some used districts. Some had the state legislature pick. When it came time for the electors to vote, nobody was quite sure who was going to win because many states slates were up in the air. In the end, Adams nosed out Jefferson by three votes, picking up key votes in Maryland and one each in Virginia and North Carolina, to put him over the top. Although the New Englander Adams did not wish to garner support from slave states, his plan for a strong central government appealed to a certain type of Southern plantation owner. Some Federalists, most notably Andrew Hamilton, were trying to maneuver South Carolinian Thomas Pinckney into either the presidency or vice presidency, but could not coordinate voting efforts well enough to do that. On Inauguration Day, Jefferson made a conciliatory speech and vowed to work well with Adams. They never did and the two men were estranged for about 20 years. So, whatever you’ve seen in American politics in your lifetime is likely nothing that hasn’t happened before in some form before. Americans have a long history of hating the people on the other side of the political spectrum. That is the most important thing to take away from this fascinating book.